Without a doubt, Bernie Wrightson was the foremost and most loved horror artist of the last 50 years. Although he produced great work throughout his career, he hit his stride in the early 70s and that peak continued until he produced his career defining Frankenstein work. This unfinished but delightful drawing was created in that period. Wrightson's discarded work is better than most artist’s best work during this period. 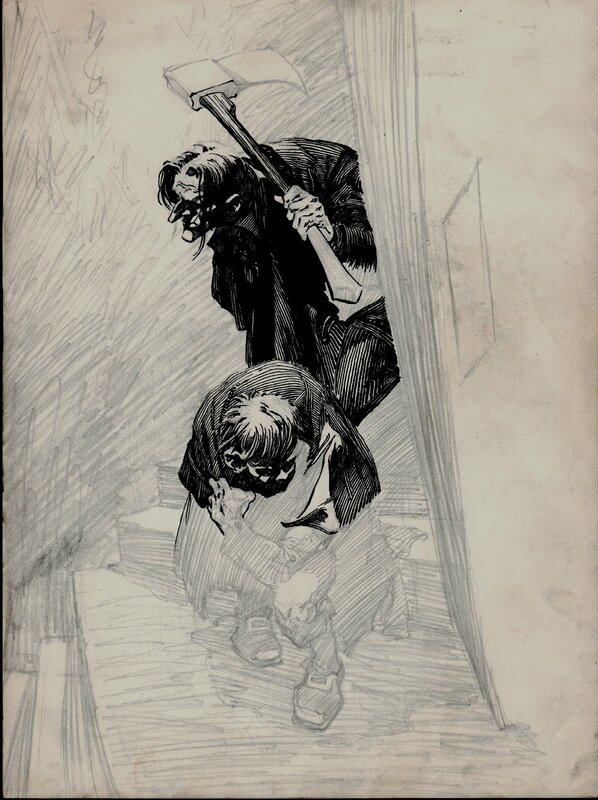 This drawing with 2 Grave Robbers has a great Victorian feel which Bernie did so well. You can see the development of the artist’s work here and his fine line inking style that would define the Frankenstein plates, as the main character with ax is fully inked, and the short IGOR-looking guy is half inked. If you can’t afford $50,000+ for a finished Frankenstein plate, this peak period part penciled and part inked pinup would be a great and inexpensive example of this horror master’s memorable 1970s ink work. Art is drawn on 9 by 12 inch art board. ALL art on our website (including this one) are able to be purchased with VERY fair time payments, and trades are always considered towards "ANY" art on our website! Just send us an email to mikeburkey@aol.com and we can try to work something out.